Lapstrake planking refers to the method of attaching planks to the frames and to themselves. The planks actually "lap" one edge over another as opposed to butting together at their edges as in standard batten-seam or straight-carvel construction. This method, used for hundreds of years and sometimes referred to as "clinker-built," adds strength to the hull in that where the lap occurs the fastened doubling of plank thickness essentially forms a "stringer" at each plank edge. These inherent longitudinal stiffeners allow the boat to be designed with lighter plank stock of half the normal molded thickness (inboard-outboard measurement) and framing that is usually steam bent rather than sawn-sistered and thus about one third the size and weight, molded and sided (fore-and-aft dimension). Many of these boats use a combination of steam-bent and sawn frames, especially forward at the bow and aft at the transom. The bottomsides and topsides are usually one continuous curved shape with round bilges instead of a hard chine at the turn of the bilge. The inherent lower cost of materials and labor produced a boat the average man could afford. Those who are familiar with driving lapstrake boats know that they have more stability and sea kindness than flat-bottomed, hard-chined power boats. Each one of those protruding laps at the bow acts as a sort of shock absorber, turning the force of breaking water to the side and, following dozens of stabilizing fins. There must be something to this because brand-new fiberglass speed boats also feature these protruding laps. The discussion here applies to Chris-Craft Sea Skiffs, Lymans, Centurys, Grady-Whites, Thompsons, and dozens of other marques. Lyman began their lapstrake inboard line in 1930, though they had been using clinker construction since the 1800s. They continued their plywood lapstrakes until the early 1970s. Chris-Craft began producing their plywood lapstrake Sea-Skiff line in 1953. Starting at 18 feet, these boats eventually were built to 43 feet. Century introduced their Viking in 1954 and later produced the Raven, which was built of solid mahogany plank, as opposed to plywood. 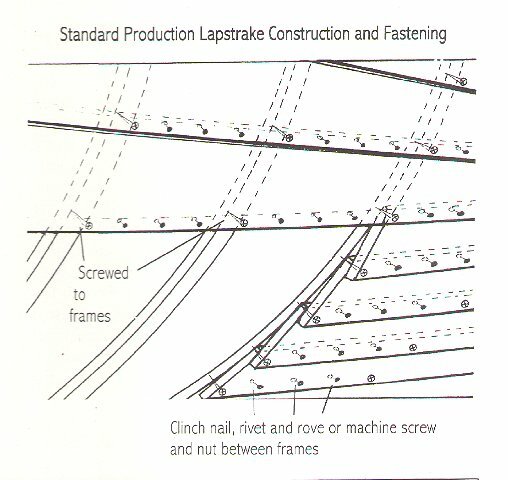 Lapstrake planks are usually screw-fastened to the frames where the lapped planks intersect the curved outboard surface of the bent frame. This means that the planks are only fastened to the frames at the top edge and bottom edge of each plank, unlike carvel construction where the full width of the plank is tight against the frames with three to four screws to hold the plank from cupping. 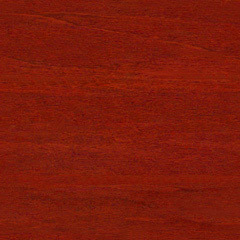 Plywood, because of its multitude of grain directions, actually makes a much better plank stock than solid wood for lapstrake boats. 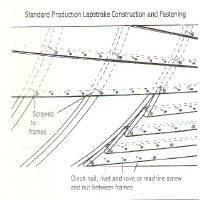 It is less liable to bow or crack longitudinally where lapstrake construction leaves unsupported. The real downside to this type of construction is the gap that is left between the frame and center of the inboard surface of the plank. This leaves hundreds of handy catchalls to collect dirt and debris, which can hold moisture above 30 percent and allow rot spore to flourish. As far as I've seen, in these mass-produced plywood lapstrake, the oak frames were steam bent into the hull and fastened in place, with the outboard surfaces of the frames never getting any sealer or paint. 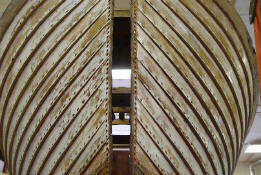 In most cases, removal of planks shows that the boat also did not get bilge paint until after assembly. This means that the very spots that are prone to trap moisture and foment rot are not sealed against this. Remember: The factory simply didn't expect these boats to last as long as they have. It is especially important to keep this type of bilge clean and dry. The greatest problems occur at the turn of the bilge just beneath the floorboards. 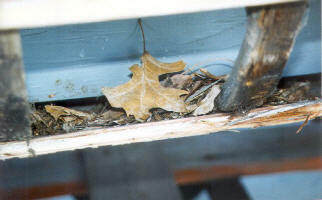 Dirt, debris, and the biggest offender, leaves, get past the edge of the floorboards and accumulate in these plank-to-frame gaps just out of sight, and never get washed into the center of the bilge where you can see them and clean them out. Unfortunately, this area at the turn of the bilge is where the unsealed oak frames were forced to take the greatest stress in the bending of the tightest curves. Here, the outboard faces of these frames probably exhibited surface checking from day one. Could there be a more perfect for rot spore to get deeply into the frames? One fellow brought his 25-foot Sea Skiff to my shop and asked that I replace four planks that his surveyor indicated needed replacement before insurance could be written. The survey indicated two identical rotted plank sections just below the turn of the bilge on either side of the boat. I removed each plank section and sure enough, there sat a little pile of leaves on each side of the boat, returning to nature and taking the plank with them. Directly above each little offending pile was a deck vent with its screen missing. If your lapstrake did not come from the factory with a piece of brass or copper screen beneath the deck vents, you should add them. Come to think of it, all wooden boats should probably have these. Cleaning your entire bilge annually (not just the center under the hatches) is probably the best thing you can do for any type of wooden boat, lapstrake or not. If you have a lapstrake wooden boat and you want to keep it in sound shape, I highly recommend removing all floor boards at the end of each season and thoroughly hosing out and vacuuming dry the bilge. Leave the floorboards out until spring outfitting. You may have to cut your linoleum or rubber flooring to fit these and use oval-head screws set flush, but your hull will last longer. If you are storing the boat outdoors, cover it with a well vented tarp and make sure it does not collect leaves. 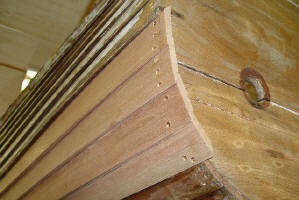 Between frames, the planks, where they lap over each other, are typically fastened together with two or more fasteners. These are usually not screws, though, because the plank edges (at least one of them and most often the upper outboard edge), is beveled so that the next unbeveled plank (most often the lower inboard edge) can make a tight wood-to-wood joint. The inner beveled edge, therefore, has been reduced too much in thickness to hold a woodscrew. Because the builders did not want this shingled effect to be present at the stem and transom, the planking bevel would be increased in degree and applied to both plank surfaces so that the planks would lie nearly flat against one another at the stem and stern. This increases in bevel is referred to as "gains." The standard method of fastening these planks between frames is with clinch nails, where a nail is driven through and "clinched" or bent over. 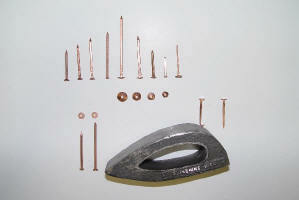 A common earlier method was with rivet and rove. With this method, a nail, usually copper, was driven through and a "rove" or "burr," a tight-fitting washer also made of copper, was set tightly and the nail was snipped short and its end "peened" over to form a head against the rove. 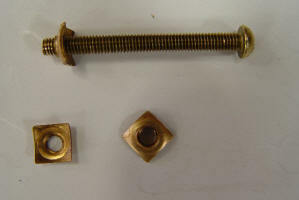 A third method used by some manufacturers is a machine screw with washer and nut on the inside. Some used a "PM" nut, a combination of washer and nut stamped from sheet metal with protruding teeth to keep them from spinning when set.